This Italian white wine made with the vermentino grape smells of orange blossoms and vanilla. It is very stony with herbal qualities like tarragon or majoram (though that may be the majoram butter from the corn on the cob I had for dinner talking). Banana, vanilla, and lemon notes abound, resulting mostly in a distant memory of lemon biscuit cookies. Pleasing and certainly worth finding a package of slightly savory cookies to go along with it. It is clean and precise with a hint of green apple and minerality. A pleasant wine. Wino’s rated Excellent 2, Very good 4 Good 11. 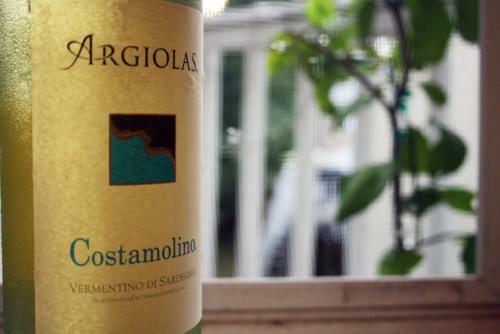 The 2009 Vermentino di Sardegna Costamolino is a clean, precise white that seems to have acquired an extra level of textural richness in this vintage. Beautifully delineated throughout, the Costamolino shows off lovely balance and a pure, crystalline finish. The Costamolino has a luminous golden color . . . while the Uvaggio is a pale straw and slightly cloudy . . . the Costamolino has outstanding, elegant aromas of citrus and pineapple, and tastes of stone fruits and honey—practically bursting with fruit while the zesty acidity danced on the tongue. It is supple, elegant and fresh—just what you want from this varietal.